The start of a new year is the perfect time to embrace a fresh look in your home, but more often than not, post-Christmas bank balances are still recovering from all the festivities – and this is something that can often still be felt well into the new year. However, ,making impactful updates to your home doesn’t have to cost a small fortune. In today’s post, we’re sharing some impressive budget tiling hacks – helping you to refresh your home interiors without putting a strain on your finances. Splashbacks are not only functional, but they’re also fast-becoming a fashionable feature in kitchens and bathrooms – and, if money’s tight, they’re the perfect way to instantly refresh an area with minimal effort and expense. Armed with a sheet of MDF cut to the size of the area you want to re-tile, and some classic kitchen wall tiles like metro tiles, you can achieve a sleek and chic finish in no time. The affordability and ease of installing these materials make this the ideal budget tiling hack, whether you opt to lay your kitchen wall tiles horizontally or in a pretty herringbone pattern. If faced with updating a large floor space, you may be finding it tricky to balance your budget and style, but you can make a dent in the cost of large-scale interior updates by choosing to mix and match different materials within your design. For instance, using kitchen floor tiles in conjunction with other materials like hardwood or laminate will help your budget to stretch further, while also delivering a stunning and unique aesthetic. This concept works wonderfully in open-plan spaces, where the contrasting materials serve as a subtle and stylish divide between the different areas. Although there’s a shift to softer and more subtle hues, Moroccan interiors will continue to be a popular choice in 2019, so it could be time to give your old furniture pieces a new lease of life with a tile makeover? Bathroom wall tiles with encaustic designs or even mosaics are the perfect way to update tabletops, dressers, sink units and mirrors throughout your home – bringing with them a colourful and exotic feel. While they may not offer the same softness and warmth underfoot as you’d find with a traditional woven rug, tiled rugs are nonetheless a powerful addition to any home interior – whether it’s a focal point in your dining room, hallway or even your bathroom. On a tight budget, you can add a striking centrepiece to any floor with kitchen or bathroom floor tiles – leaving you with a hard-wearing, fashionable and truly bespoke rug. Quite often, decorative tiles come with a higher price tag, but this doesn’t mean you need to dismiss them all together. If you have your eye on an expensive tile, you have two options. You may simply choose to use a small amount in a small area or, alternatively, pair your pricier tile with a cheaper option – using more of the latter to keep the overall cost down. 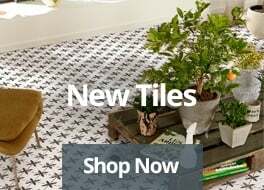 Using fewer expensive tiles as decorative features or borders and teaming them with cheaper tiles to cover larger areas will allow you to make a style statement without breaking the bank. While interior design makeovers can be costly, we hope these ideas will give you all the inspiration you need to get stuck into some home updates this year without worrying about the associated price tag. 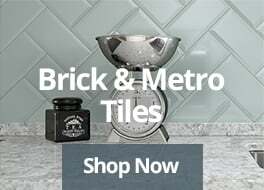 Why not get started on your own project for 2019 now, taking advantage of our Christmas sale packed with a selection of stunning kitchen and bathroom tiles all at great value prices – perfect for those on a strict budget?